The Coordinated Regional Downscaling Experiment (CORDEX) is a diagnostic MIP in CMIP6. CORDEX builds on a foundation of previous downscaling intercomparison projects to provide a common framework for downscaling activities around the world. 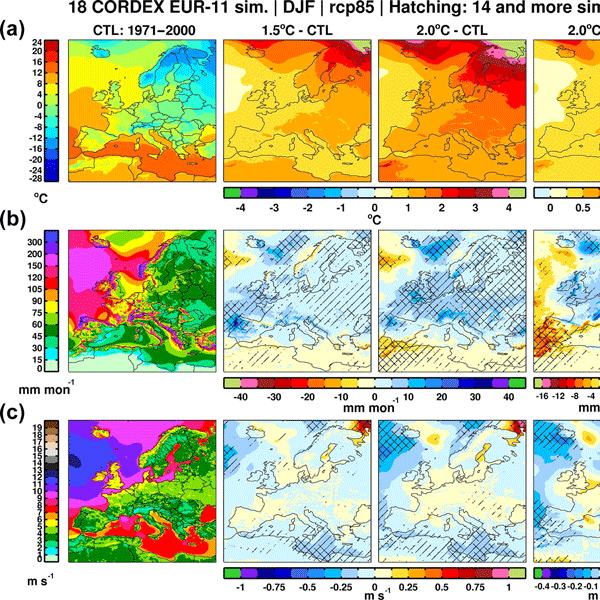 The CORDEX Regional Challenges provide a focus for downscaling research and a basis for making use of CMIP6 global output to produce downscaled projected changes in regional climates, and assess sources of uncertainties in the projections. 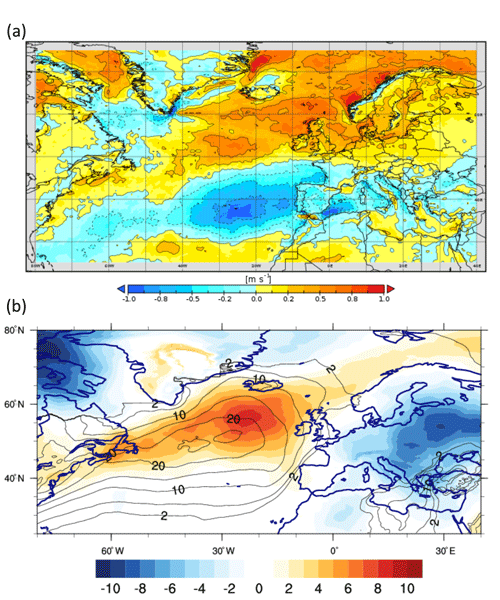 The paper presents a new cloud scheme for regional climate model RegCM4.5. The new scheme treats microphysical processes occurring within stratiform clouds and with respect to the pre-existing scheme is able to allow a more physically realistic representation of cloud microphysics and distribution, improving the representation of the longwave and shortwave components of the cloud radiative forcing. To study the distribution of airborne ragweed pollen in changing environments and associated health risks over Europe, we introduce an approach with explicit treatment of pollen ripening, release and dispersion due to environmental drivers in an online modelling framework where climate is integrated with dispersion and vegetation production. From a simulated pollen season and concentration pattern health risks are evaluated through calculation of exposure time above health-relevant threshold levels. This paper makes a rather exhaustive overview of current knowledge of past, current, and future aspects of cryospheric issues in continental Europe and makes a number of reflections of areas of uncertainty requiring more attention in both scientific and policy terms. The review paper is completed by a bibliography containing 350 recent references that will certainly be of value to scholars engaged in the fields of glacier, snow, and permafrost research. Sea-level rise associated with changing climate is expected to pose a major challenge for societies. Based on the efforts of COP21 to limit global warming to 2.0 °C by the end of the 21st century (Paris Agreement), we simulate the future contribution of the Greenland ice sheet (GrIS) to sea-level change. The projected sea-level rise ranges between 21–38 mm by 2100 and 36–85 mm by 2300. Our results indicate that uncertainties in the projections stem from the underlying climate data. The purpose of the Intergovernmental Panel on Climate Change (IPCC) is to provide policy-relevant assessments of the scientific evidence about climate change. Policymaking necessarily involves risk assessments, so it is important that IPCC reports are designed accordingly. This paper proposes a specific idea, illustrated with examples, to improve the contribution of IPCC Working Group I to informing climate risk assessments. Climate change projections of temperature extremes are particularly uncertain in central Europe. We demonstrate that varying soil moisture–atmosphere feedbacks in current climate models leads to an enhancement of model differences; thus, they can explain the large uncertainties in extreme temperature projections. Using an observation-based constraint, we show that the strong drying and large increase in temperatures exhibited by models on the hottest day in central Europe are highly unlikely. Results show that an additional 6.97 million people will be exposed to droughts in China under a 1.5 ºC target relative to reference period, mostly in the east of China. Demographic change is the primary contributor to exposure. Moderate droughts contribute the most to exposure among 3 grades of drought. Our simulations suggest that drought impact on people will continue to be a large threat to China under the 1.5 ºC target. It will be helpful in guiding adaptation and mitigation strategies. During the last years, a new method for reconstructing the strength of the monsoonal systems has been developed. This new method uses old wind observations taken aboard sailing ships. In our research we have generalised this method and we have been able to produce the first instrumental reconstruction starting in the 19th century of a low level wind current called Chocó-jet, which is the main responsible of the moisture transport from the Pacific onto Central America and northern South America. Limiting global warming to 1.5 °C may require carbon removal from the atmosphere. We explore how the climate system differs when we achieve the 1.5 °C limit by rapid emissions reductions versus when we overshoot this limit, hitting 2 °C at mid-century before removing CO2 from the atmosphere. We show that sea level, ocean acidification, regional warming, and ocean circulation are very different under the overshoot pathway at 2100, despite hitting the 1.5 °C target for surface warming. Based on high-resolution regional climate models we investigate European climate change at 1.5 and 2 °C of global warming compared to pre-industrial levels. Considerable near-surface warming exceeding that of the global mean is found for most of Europe, already at the lower 1.5 °C of warming level. Changes in precipitation and near-surface wind speed are identified. The 1.5 °C of warming level shows significantly less change compared to the 2 °C level, indicating the importance of mitigation. This study investigates the midlatitude atmospheric circulation response to 1.5°C and 2.0°C of warming using modelling experiments run for the HAPPI project (Half a degree Additional warming, Prognosis & Projected Impacts). While the chaotic nature of the atmospheric flow dominates in these low-end warming scenarios, some local changes emerge. Case studies explore precipitation impacts both for regions that dry (Mediterranean) and regions that get wetter (Europe, North American west coast). This study uses the cumulative distribution function transform (CDF-t) method to provide bias-corrected data over Africa using WFDEI as a reference dataset. It is shown that CDF-t is very effective in removing the biases and reducing the high inter-GCM scattering. Differences with other bias-corrected GCM data are mainly due to the differences among the reference datasets, particularly for surface downwelling shortwave radiation, which has a significant impact in terms of simulated maize yields. 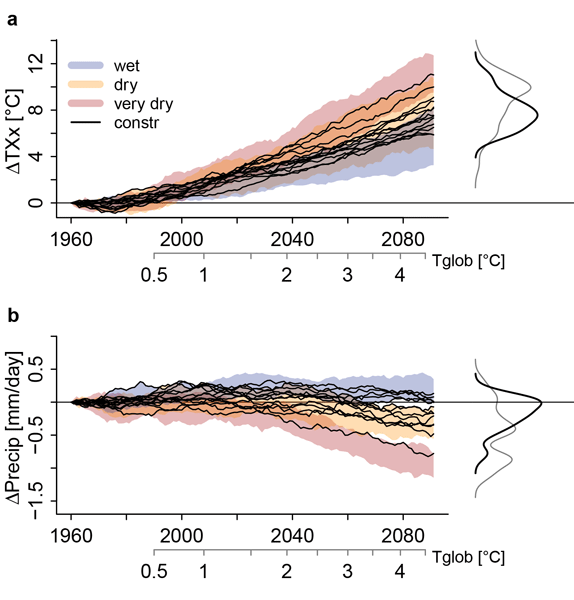 This study is the first risk-based assessment of changes in global drought at 1.5 and 2 °C warmer worlds using CMIP5 models. By keeping the warming at 1.5 °C above the preindustrial levels instead of 2 °C, the risks of drought and the affected total, urban and rural populations would decrease at global and regional scales. While challenging for both East Africa and South Asia, the benefits of limiting warming to below 1.5 °C in terms of global drought risk and impact reduction are significant. Fires damage large areas of eastern Amazon forests when ignitions from human activity coincide with droughts, while more humid central and western regions are less affected. Here, we use a fire model to estimate that fire activity could increase by an order of magnitude without climate mitigation. 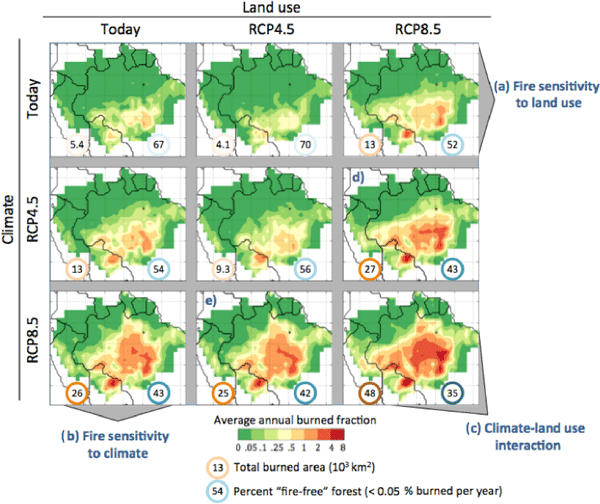 Our results show that avoiding further agricultural expansion can limit fire ignitions but that tackling climate change is essential to insulate the interior Amazon through the 21st century. We present the results of a set of climate simulations designed to simulate futures in which the Earth's temperature is stabilized at the levels referred to in the 2015 Paris Agreement. We consider the necessary future emissions reductions and the aspects of extreme weather which differ significantly between the 2 and 1.5 °C climate in the simulations. We compare the latest observations of relative and specific humidity with those from climate models. The climate models do not accurately reproduce the observed humidity behaviour for the last 15–20 years. We use the temporal, spatial and trend information to contrast the patterns exhibited by the observations and models. The temporal behaviour of the observations has previously been documented and is consistent with faster warming rates over land compared to oceans. The increase in atmospheric greenhouse gases (GHGs) is one of the main causes for the increase in global mean surface temperature. There is no good quantitative measure to determine when it is too late to start reducing GHGs in order to avoid dangerous anthropogenic interference. We develop a method for determining a so-called point of no return (PNR) for several GHG emission scenarios. The innovative element in this approach is the applicability to high-dimensional climate models. We discuss for the first time changes in the wave climate in the Baltic Sea over the last 2 decades derived from satellite altimetry data spanning over 26 years. We found in the study that there are variations in the wave climate of the Baltic Sea, which can be interpreted as being caused predominantly by a rotation of wind direction rather than increased wind speed, implying that associated variations in the airflow direction can be a dominant driver of regional climate changes. Recent UNFCCC climate meetings have placed much emphasis on constraining global warming to remain below 2 °C. The 2015 Paris meeting went further and gave an aspiration to fulfil a 1.5 °C threshold. We provide a flexible set of algebraic global temperature profiles that stabilise to either target. This will potentially allow the climate research community to estimate local climatic implications for these temperature profiles, along with emissions trajectories to fulfil them. A first comprehensive and systematic hydroclimatic trend analysis for the upper Indus Basin suggests warming and drying of spring and rising early melt-season discharge over 1995–2012 period. In contrast, cooling and falling or weakly rising discharge is found within summer monsoon period that coincides well with main glacier melt season. Such seasonally distinct changes, indicating dominance of snow but suppression of glacial melt regime, address hydroclimatic explanation of Karakoram Anomaly . In a climate projection experiment with the Max Planck Institute Earth System Model (MPI-ESM), we find that a decline in the Atlantic Ocean meridional heat transport (OHT) is accompanied by a change in the seasonal cycle of the total OHT and its components. We found a northward shift of 5° and latitude-dependent shifts between 1 and 6 months in the seasonal cycle that are mainly associated with changes in the meridional velocity field rather than the temperature field. We introduce a novel technique to bias correct climate model output for impact simulations that preserves its physical consistency and multivariate structure. 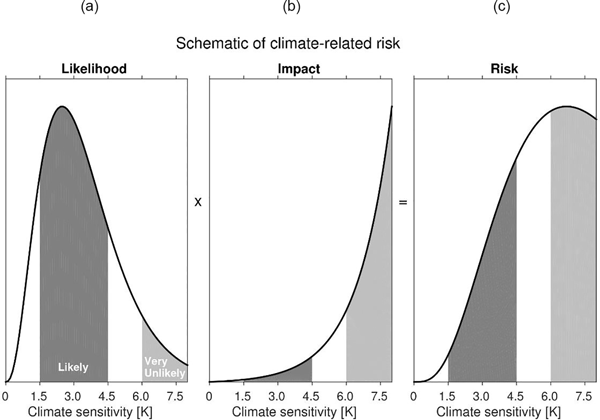 The methodology considerably improves the representation of extremes in climatic variables relative to conventional bias correction strategies. Illustrative simulations of biosphere–atmosphere carbon and water fluxes with a biosphere model (LPJmL) show that the novel technique can be usefully applied to drive climate impact models. A conceptual model for the global temperature response to CO2 emissions is presented. 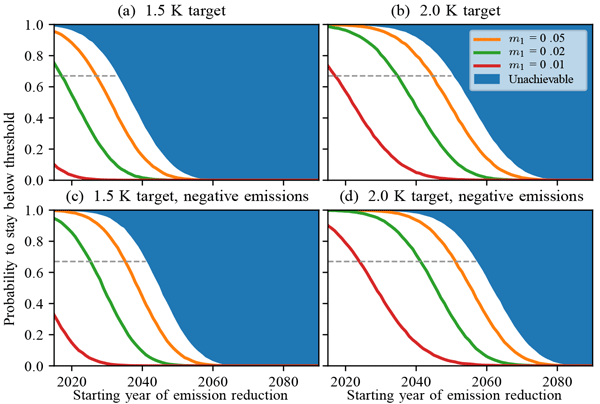 Based on observation data, projections of future warming are computed for instructive emission scenarios. Delays in the initiation of global emission reduction is found to be the most important factor driving global warming over the next 2 centuries. The model is intended as a tool for communicating the issue to non-climatologists, students, policy makers, and the general public. This study using a variable resolution global climate model having high-resolution zooming over the South Asian region indicates that the anthropogenic effects have influenced the recent weakening of the monsoon circulation and decline of precipitation. The simulated increase of surface temperature over the Indian region during the post-1950s is accompanied by a significant decrease of monsoon precipitation and soil moisture. This summer time soil drying is detectable under RCP4.5 scenario. Allan, R. P. and Soden, B. J.: Atmospheric warming and the amplification of precipitation extremes, Science, 321, 1481–1484, 2008. Anstey, J. A., Davini, P., Grey, L. J., Woollings, T. J., Butchart, N., Cagnazzo, C., Christiansen, B., Hardiman, S. C., Osprey, S. M., and Yang, S.: Multi-model analysis of northern hemisphere winter blocking: Model biases and the role of resolution, J. Geophys. Res.-Atmos., 118, 3956–3971, 2013. Becker, T., Stevens, B., and Hohenegger, C.: Imprint of the convective parameterization and sea surface temperature on large scale convective self-aggregation, J. Adv. Model Earth Syst., 9, 1488–1505, 2017. Biasutti, M., Voigt, A., Boos, W. R., Bracconot, P., Hargreaves, J. C., Harrison, S. P., Kang, S. M., Mapes, B. E., Scheff, J., Schumacher, C., Sobel, A. H., and Xie, S.-P.: Global energetics and local physics as drivers of past, present and future monsoons, Nat. Geosci., 11, 392–400, 2018. Boberg, F., Berg, P., Thejll, P., Gutowski, W. J., and Christensen, J. H.: Improved confidence in climate change projections of precipitation evaluated using daily statistics from the PRUDENCE ensemble, Clim. Dynam., 32, 1097–1106, 2009. Byrne, M. P., Pendergrass, A. G., Rapp, A. D., and Wodzicki, K. R.: Response of the Intertropical Convergence Zone to Climate Change: Location, Width, and Strength, Curr. Clim. Chang. Reports, 4, 355–370, 2018. Chen, D. and Dai, A.: Dependence of estimated precipitaiton frequency and intensity on data resolution, Clim. Dynam., 50, 3625–3647, 2018. Chou, C., Chen, C.-A., Tan P.-H., and Chen, K. T.: Mechanisms for global warming impacts on precipitation frequency and intensity, J. Climate, 25, 3291–3306, 2012. Christensen, J. H. and Christensen, O. B.: Climate modeling: Severe summertime flooding in Europe, Nature, 421, 805–806, 2003. Diffenbaugh, N. S., Giorgi, F., Raymond, L., and Bi, X.: Indicators of 21st century socioclimatic exposure, P. Natl. Acad. Sci. USA, 104, 20195–20198, 2007. Easterling, D. R., Meehl, G. A., Parmesan, C., Changnon, S. A., and Mearns, L. O.: Climate extremes: Observations, modeling and impacts, Science, 289, 2068–2074, 2000. Fischer, E. M. and Knutti, R.: Observed heavy precipitation increase confirms theory and early models, Nat. Clim. Change, 6, 986–990, 2016. Flato, G., Marotzke, J., Abiodun, B., Bracconot, P., Chou, S. C., Collins, W., Cox, P., Driouech, F., Emori, S., Eyring, V., Forest, C., Glecker, P., Guiliard, E., Jacob, C., Kattsov, V., Reason, C., and Rummukainen, M.: Evaluation of climate models. Chapter 9 of Climate Change 2013. The Physical Science Basis, Contribution of Working Group I to the Fifth Assessment Report of the Intergovernmental Panel on Climate Change, edited by: Stocker, T. F., Dahe, Q., Plattner, G.-K., Tignor, M. M. B., Allen, S. K., Boschung, J., Nauels, A., Xia, Y., Bex, V., and Midgley, P. M., Cambridge University Press, Cambridge, United Kingdom and New York, NY, USA, 741–866, 2013. Gao, X. J., Pal, J. S., and Giorgi, F.: Projected changes in mean and extreme precipitation over the Mediterranean region from high resolution double nested RCM simulations, Geophys. Res. Lett., 33, L03706, https://doi.org/10.1029/2005GL024954, 2006. Giorgi, F. and Bi, X.: Regional changes in surface climate interannual variability for the 21st century from ensembles of global model simulations, Geophys. Res. Lett., 32, L13701, https://doi.org/10.1029/2005GL023002, 2005. Giorgi, F. and Coppola, E.: Projections of 21st century climate over Europe, EPJ Web Conf., 1, 29–46, 2009. 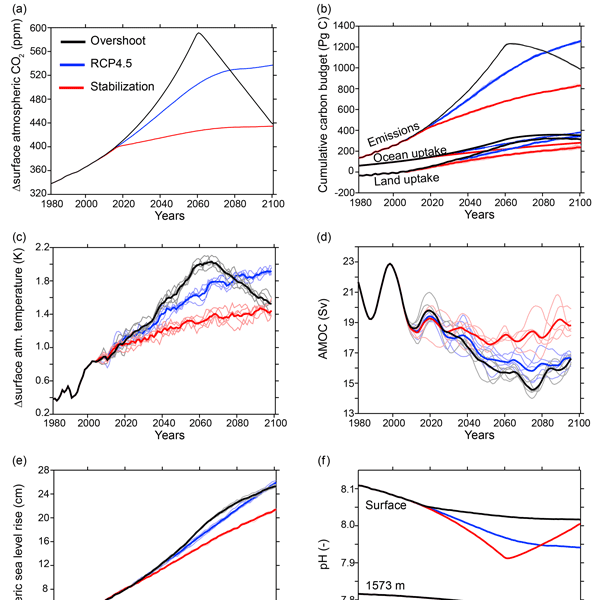 Giorgi, F., Shields Brodeur, C., and Bates, G. T.: Regional climate change scenarios over the United States produced with a nested regional climate model, J. Climate, 7, 375–399, 1994. Giorgi, F., Jones, C., and Asrar, G.: Addressing climate information needs at the regional level: The CORDEX framework, WMO Bulletin, 58, 175–183, 2009. Giorgi, F., Im, E.-S., Coppola, E., Diffenbaugh, N. S., Gao, X. J., Mariotti, L., and Shi, Y.: Higher hydroclimatic intensity with global warming, J. Climate, 24, 5309–5324, 2011. Giorgi, F., Coppola, E., Solmon, F., Mariotti, L., Sylla, M. B., Bi, X., Elguindi, N., Diro, G. T., Nair, V., Giuliani, G., Turuncoglu, U. U., Cozzini, S., Guttler, I., O'Brien, T. A., Tawfik, A. B., Shalaby, A., Zakey, A. S., Steiner, A. L., Stordal, F., Sloan, L. C., and Brankovic, C.: RegCM4: Model description and preliminary tests over multiple CORDEX domains, Clim. Res., 52, 7–29, 2012. Giorgi, F., Coppola, E., and Raffaele, F.: A consistent picture of the hydroclimatic response to global warming from multiple indices: Modeling and observations, J. Geophys. Res., 119, 11695–11708, 2014a. Giorgi, F., Coppola, E., Raffaele, F., Diro, G. T., Fuentes-Franco, R., Giuliani, G., Mamgain, A., Llopart-Pereira, M., Mariotti, L., and Torma, C.: Changes in extremes and hydroclimatic regimes in the CREMA ensemble projections, Clim. Change, 125, 39–51, 2014b. Giorgi, F., Torma, C., Coppola, E., Ban, N., Schar, C., and Somot, S.: Enhanced summer convective rainfall at Alpine high elevations in response to climate warming, Nat. Geosci., 9, 584–589, 2016. Giorgi, F., Coppola, E., and Raffaele, F.: Threatening levels of cumulative stress due to hydroclimatic extremes in the 21st century, NPJ Climate and Atmospheric Science, 1, 18, https://doi.org/10.1038/s41612-018-0028-6, 2018. Gutowski Jr., W. J., Takle, E. S., Kozak, K. A., Patton, J. C., Arritt, R. W., and Christensen, J. C.: A possible constraint on regional precipitation intensity changes under global warming, J. Hydrometeorol., 8, 1382–1396, 2007. Gutowski Jr., W. J., Giorgi, F., Timbal, B., Frigon, A., Jacob, D., Kang, H.-S., Raghavan, K., Lee, B., Lennard, C., Nikulin, G., O'Rourke, E., Rixen, M., Solman, S., Stephenson, T., and Tangang, F.: WCRP COordinated Regional Downscaling EXperiment (CORDEX): a diagnostic MIP for CMIP6, Geosci. Model Dev., 9, 4087–4095, https://doi.org/10.5194/gmd-9-4087-2016, 2016. Herold, N., Behrangi, A., and Alexander, L. V.: Large uncertainties in observed daily precipitation extremes over land, J. Geophys. Res.-Atmos., 122, 668–681, 2017. Intergovernmental Panel on Climate Change (IPCC): Climate Change 2007. The Physical Science Basis. Working Group I Contribution to the Fourth Assessment Report of the Intergovernmental Panel on Climate Change, edited by: Solomon, S., Qin, D., Manning, M., Marquis, M., Averyt, K., Tignor, M. M. B., Miller Jr., H. L., and Chen, Z., Cambridge University Press, Cambridge, UK, 996 pp., 2007. Intergovernmental Panel on Climate Change (IPCC): Managing the risks of extreme events and disasters to advance climate change adaptation, IPCC Special Report, edited by: Field, C. B., Barros, V., Stocker, T. F., Dahe, Q., Dokken, D. J., Ebi, K. L., Mastrandrea, M. D., Mach, K. J., Plattner, G.-K., Allen, S. K., Tignor, M., and Midgley, P. M., Cambridge University Press, Cambridge, UK, 582 pp., 2012. Intergovernmental Panel on Climate Change (IPCC): Climate Change 2013. The Physical Science Basis. Contribution of Working Group I to the Fifth Assessment Report of the Intergovernmental Panel on Climate Change, edited by: Stocker, T. F., Dahe, Q., Plattner, G.-K., Tignor, M. M. B., Allen, S. K., Boschung, J., Nauels, A., Xia, Y., Bex, V., and Midgley, P. M., Cambridge University Press, Cambridge, United Kingdom and New York, NY, USA, 1029 pp., 2013. Ivancic, T. J. and Shaw, S. B.: A U.S. based analysis of the ability of the Clausius-Clapeyron relationship to exaplin changes in extreme rainfall with changing temperature, J. Geophys. Res.-Atmos., 121, 3066–3078, 2016. Jacob, D., Petersen, J., Eggert, P., Alias, A., Christensen, O. B., Bouwer, L. M., Braun, A., Colette, A., Deque, M., Georgievski, G., Georgopoulou, E., Gobiet, A., Menut, L., Nikulin, G., Haensler, A., Hampelmann, N., Jones, C., Keuler, K., Kovats, S., Kroner, N., Kotlarski, S., Kriegsmann, A., Martin, E., van Meijgaard, E., Moseley, C., Pfeifer, S., Preuschmann, S., Radermacher, C., Radtke, K., Rechid, D., Rounsevell, M., Samuelsson, P., Somot, S., Soussana, J. F., Teichmann, C., Valentini, R., Vautard, R., Weber, B., and Yiou, P.: EURO-CORDEX: New high resolution climate change projections for European impact research, Reg. Environ. Change, 14, 563–578, 2014. Jones, C., Giorgi, F., and Asrar, G.: The COordinated Regional Downscaling EXperiment: CORDEX. An international downscaling link to CMIP5, CLIVAR Exchanges, 16, 34–40, 2011. Kharin, V. V., Zwiers, F. W., and Zhang, X.: Intercomparison of near surface temperature and precipitation extremes in AMIP-2 simulations, reanalyses and observations, J. Climate, 18, 5201–5233, 2005. Lenderink, G. and van Meijgaard, K.: Increase in hourly extreme precipitaiton beyond expectations from temperature change, Nat. Geosci., 1, 511–514, 2008. Moss, R. H., Edmonds, J. A., Hibbard, K. A., Manning, M. R., Rose, S. K., van Vuuren, D. P., Carter, P. R., Emori, S., Kainuma, M., Kram, T., Meehl, G. A., Mitchell, J. F. B., Nakicenovic, N., Rihai, K., Smith, S. J., Stouffer, R. J., Thompson, A. M., Weyant, J. P., and Willbanks, T. J.: The next generation of scenarios for climate change research and assessment, Nature, 463, 747–756, 2010. Mueller, C. J. and Held, I. M.: Detailed investigation of the self-aggregation of convection in cloud-resolving simulations, J. Atmos. Sci., 69, 2551–2565, 2012. 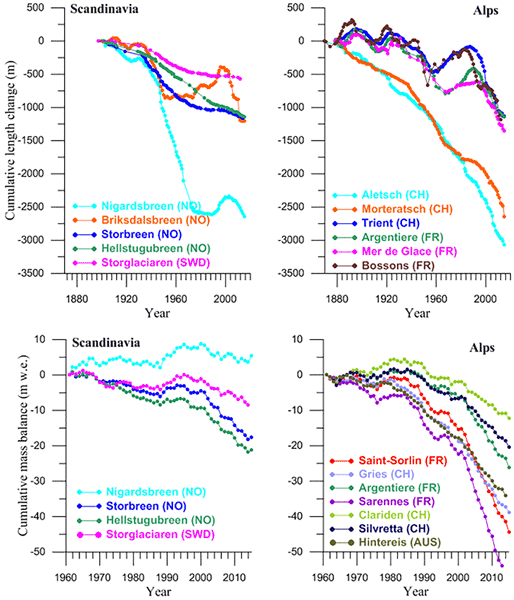 Pall, P., Allen, M. R., and Stone, D. A.: Testing the Clausius-Clapeyron constraint on changes in extreme precipitaiton under CO2 warming, Clim. Dynam., 28, 351–363, 2007. Pendergrass, A. G. and Hartmann, D. L.: Changes in the distribution of rain frequency and intensity in response to global warming, J. Climate, 27, 8372–8383, 2014. Pendergrass, A. G., Knutti, R., Lehner, F., Deser, C., and Sanderson, B. M.: Precipitation variability increases in a warmer climate, Sci. Rep.-UK, 7, 17966, https://doi.org/10.1038/s41598-017-17966-y, 2017. Pfahl, S., O'Gorman, P. A., and Fischer, E. M.: Understanding the regional pattern of projected future changes in extreme precipitation, Nat. Clim. Change, 7, 4230427, https://doi.org/10.1038/nclimate3287, 2017. Power, S., Delage, F., Chung, C., Kociuba, G., and Keay, K.: Robust twenty-first century projections of El-Nino and related precipitation variability, Nature, 502, 541–545, 2013. Prein, A. F., Langhans, W., Fosser, G., Ferrone, A., Ban, N., Goergen, K., Keller, M., Tolle, M., Gutjahr, O., Feser, F., Brisson, E., Koller, S., Schmidli, J., van Lipzig, N. P. M., and Leung, R.: A review on regional convection-permitting climate modeling: Demonstrations, prospects and challenges, Rev. Geophys., 53, 323–361, 2015. Raisanen, J.: CO2 – induced changes in interannual temperature and precipitation variability in 19 CMIP2 experiments, J. Climate, 15, 2395–2411, 2002. Rihai, K., van Vuuren, D. P., Kriegler, E., Edmonds, J., O'Neill, B. C., Fujimori, S., Bauer, N., Calvin, K., Dellink, R., Fricko, O., Luta, W., Popp, A., Cuaresma, J. C., Samir, K. C., Leimbach, M., Jiang, L., Kram, T., and Rao, S.: The Shared Socioeconomic Pathways and their energy, land use, and greenhouse gas emissions implications: An Overview, Global Environ. Chang., 42, 153–168, 2016. Ruti, P., Somot, S., Giorgi, F., Dubois, C., Flaounas, E., Obermann, A., Dell'Aquila, A., Pisacane, A., Harzallah, A., Lombardi, E., Ahrens, B., Akhtar, N., Alias, A., Arsouze, T., Aznar, R., Bastin, S., Bartholy, J., Beranger, K., Beuvier, J., Bouffies-Cloche, S., Brauch, J., Cabos, W., Calmanti, S., Calvet, J. C., Carillo, A., Conte, D., Coppola, E., Djurdjevic, V., Drobinski, P., Elizalde, A., Gaertner, M., Galan, P., Gallardo, C., Goncalves, M., Gualdi, S., Jorba., O., Jorda, G., Lheveder, B., Lebeaupin-Brossier, C., Li, L., Liguori, G., Lionello, P., Macias-Moy, D., Nabat, P., Onol, B., Rajkovic, B., Ramage, K., Sevault, F., Sannino, G., Struglia, M. V., Sanna, A., Torma, G., and Vervatis, V.: MED-CORDEX initiative for Mediterranean climate studies, B. Am. Meteorol. Soc., 97, 1187–1208, 2016. Schiemann, R., Demory, M.-E., Shaffrey, L. C., Strachan, J., Vidale, P. L., Mizielinski, M. S., Roberts, M. J., Matsueda, M., Wehner, M. F., and Jung, T.: The resolution sensitivity of northern hemisphere blocking in 4 25-km atmospheric global circulation models, J. Climate, 30, 337–358, 2017. Sedalcek, J. and Knutti, R.: Half of the World's population experience robust changes in the water cycle for a 2C warmer World, Environ. Res. Lett., 9, 044008, https://doi.org/10.1088/1748-9326/9/4/044008, 2014. Sillmann, J., Kharin, V. V., Zhang, X., Zwiers, F. W., and Bronaugh, D.: Climate extreme indices in the CMIP5 multimodel ensemble. Part I: Model evaluation in the present climate, J. Geophys. Res., 118, 1716–1733, 2013a. Sillmann, J., Kharin, V. V., Zwiers, F. V., Zhang, X., and Bronaugh, D.: Climate extreme indices in the CMIP5 multimodel ensemble: Part 2. Future climate projections, J. Geophys. Res., 118, 2473–2493, 2013b. Tebaldi, C., Hayhoe, K., Arblaster, J. M., and Meehl, G. A.: Going to the extremes: An intercomparison of model-simulated historical and future changes in extreme events, Clim. Change, 79, 185–211, 2006. 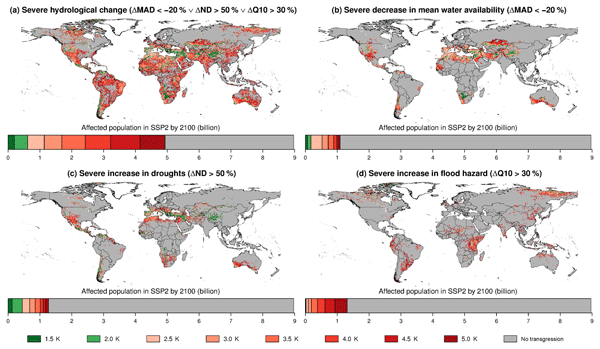 Thackeray, C. W., DeAngelis, A. M., Hall, A., Swain, D. L., and Qu, X.: On the connection between global hydrologic sensitivity and regional wet extremes, Geophys. Res. Lett., 45, 20, https://doi.org/10.1029/2018GL079698, 2018. Trenberth, K. E.: Conceptual framework for changes of extremes of the hydrological cycle with climate change, Clim. Change, 42, 327–339, 1999. Trenberth, K. E., Dai, A., Rasmussen, R. M., and Parsons, D. B.: The changing character of precipitation, B. Am. Meteorol. Soc., 84, 1205–1217, 2003. Trenberth, K. E., Smith, L., Qian, T., Dai, A., and Fasullo, J.: Estimates of the global water budegt and its annual cycle using observational and model data, J. Hydrometeorol., 8, 758–769, 2007. Warner, T. T.: Numerical Weather and Climate Prediction, Cambridge University Press, Cambridge, UK, 526 pp., 2010. Wehner, M. F., Smith, R. L., Bala, G., and Duffy, P.: The effect of horizontal resolution on simulaiton of very extreme US precipitation events in a global atmosphere model, Clim. Dynam., 24, 241–247, 2010.